If you are looking for some minimal, yet beautiful and flat looking tool to create vertical bar charts for your work and share it, try Chartico developed by Gal Shir. It lets you create simple visualization for your data in seconds. Though, it lacks in some features for power users, its minimal and beautiful interface is a pleasure to use. 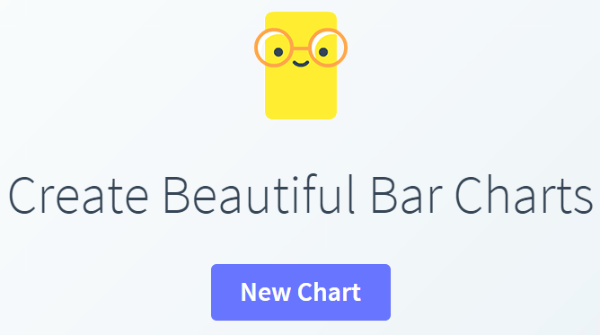 Chartico – Create beautiful bar charts. For a quick preview, select “New Chart” and you will presented with some default bars. The number of bars are randomly generated every-time, but you can add and remove it according to your preferences. 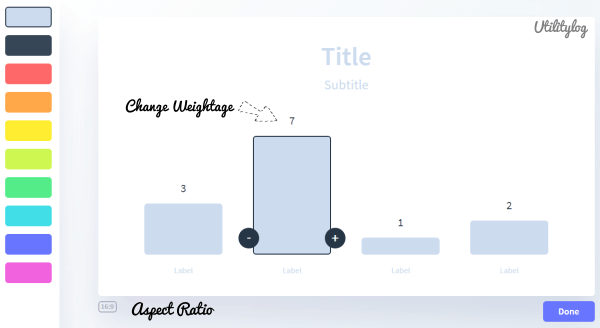 You can change the aspect ratio of your data by selecting the aspect ratio in the bottom-left. The default is 16:9, but there are other two ratios namely 4:3 and 1:1 along with default one. You can add a title and subtitle for your chart. But, there aren’t ways to change the font, size and color. To add or remove the bar, select the appropriate one and click the addition (+) or minus (-) symbol respectively. When you select the bar, you can also change the colors from a list of ten colors present at the left panel. To change the weightage of each bar, change the value present at the top of the bar and other bars present in the chart changes according to it relatively. You can label your bars by clicking on the label field present at the bottom of each bar. Once you have completed, select “Done” present at the bottom-right. You can share or tweet your work. But, there aren’t options to save it locally to your computer. Your chart will be assigned a specific URL for further use.